3 What are the Symptoms of Cold? 4 What are the Causes of Cold? 7 How to Prevent Cold? In this post, I shall discuss the best homeopathic medicine for Cold or top homeopathic cold remedies. Cold is a viral infection of your upper respiratory tract (nose and throat). Generally, it is harmless but frustrating. Children who are younger than six years are prone to cold. What are the Symptoms of Cold? A number of viruses can cause it and rhinoviruses are the most common cause. It enters in your body through eyes, nose and mouth. You can also get it from a sick person who talks, sneezes and coughs near you. It also spreads from hand to hand contact or by sharing the contaminated objects of the person who has cold such as towels, toys, telephones and utensils. Once you get a cold, you want to get rid of it as early as possible that is the instant human reaction. Allopathic medicines or conventional mode of treatment may give you some relief from a runny nose, headache, sneezing and body pain for a short period but the viral infection does not leave your body. The viral infection of the upper respiratory tract recurs and it is more frustrating for the patient. 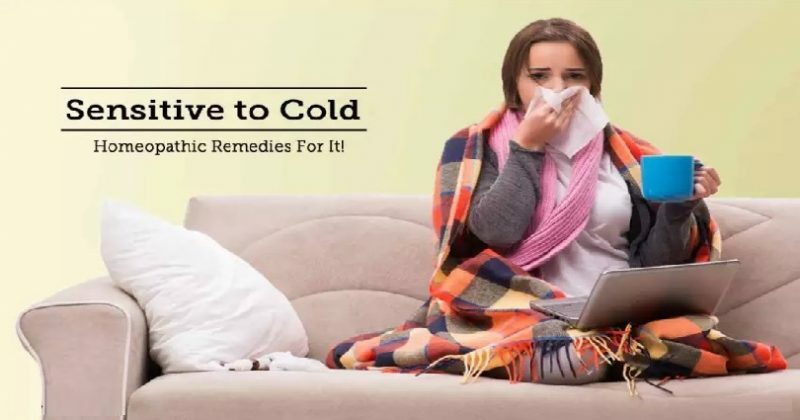 Homeopathic medicine for cold cure the cold and makes sure that the viral infection is rooted out from the body. Homeopathic medicines for cold are devoid of side-effects and made of natural substances. They are safe and they also prevent recurrence of the cold. There is no doubt in saying that Aconite is the top natural homeopathic medicine for cold after a sudden exposure to cold air. The prominent features are scanty nasal discharge with a stuffy nose. Sneezing may also present. In addition, the symptoms of anxiety and restlessness are also present. The patient may also have an increased thirst for cold water. Homeopathic medicine Arsenicum Album is prescribed for treating common cold especially when there is a symptom of watery discharge from the nose. The discharge results in burning sensation and most of the times it is associated with sneezing. The condition of the patient becomes worse in cold air. Being in a warm room gives relief to the patient. Homeopathic medicine Gelsemium is used to treat cold associated with headache. The person feels feverish. Additional symptoms are watery nasal discharge, sneezing with feeling of drowsiness and sleepiness. There is a lack of thirst of water in most of the cases. Belladonna is an ideal homeopathic medicine when pain in the throat is present with cold. The pain in throat becomes worse when you swallow anything. The throat is dry and inflamed and you may experience spells of cough with headache. Binding the head gives relief from the headache. Homeopathic remedy Nux Vomica gives excellent results when the patient feels blocked nose especially during the night while during the day, there is a watery discharge from the nose. The cold can be associated with extreme chilliness. The person wants to be warmly wrapped up. These homeopathic remedies work well in cold when the running nose is the main symptom. Homeopathic remedy Arsenic Album is prescribed when there is a thin, watery discharge from nose. It is associated with sneezing. Generally, the condition becomes worse in the open air. Allium Cepa is the top homeopathic remedy for runny nose with excessive watery discharge with headache and sneezing. The nasal discharge is burning and irritating in nature. The person gets better in the open air. Homeopathic medicine Arum Triphyllum can cure when the discharge from nose is excoriating and acrid type with a sharp unpleasant smell. Inspite of a runny nose, there is a feeling of blocked nose. Nux Vomica tops the list of homeopathic remedies to treat stuffy cold where the nose gets entirely blocked. This homeopathic medicine also works well in those cases where the nose feels entirely stuffed up. The patient also feels the blockage becoming worse at night. Homeopathic medicine Hepar Sulph is prescribed when the stoppage of nose becomes worse in cold air. Belladonna is useful to cure a violent headache associating nasal blockage because of suppressed nasal discharges. Homeopathic remedy Allium Cepa is beneficial when the sneezing is associated with nasal discharge which is burning and irritating in nature. Sabadilla is equally good as Allium Cepa but it is useful when there is excessive sneezing with a constant running nose. Homeopathic medicine Sabadilla works well in these cases. Both Dulcamara and Aconite are best homeopathic remedies to cure cold that occurs after exposure to cold air. Aconite is an ideal homeopathic medicine when the patient feels sneezing and has a stuffy nose with very little nasal discharge after cold air exposure. Homeopathic medicine Dulcamara works well to treat the total blockage of nose without any discharge after being exposed to cold air. Homeopathic medicine Eupatorium Perf is suitable for those patients who get cold with severe body pain and muscle soreness of the full body. Gelsemium is an ideal medicine to treat cold in influenza. This homeopathic medicine can be prescribed when the nasal discharge, sneezing are associated with pain in the head and a feverish feeling. Belladonna is an ideal medicine when the patient feels pain in the throat with cold. So it is a useful homeopathic medicine for cold and sore throat. There is a feeling of soreness and dryness in the throat. Extreme headache associated with cold and sore throat. Homeopathic medicine Bryonia Alba is taken when you get a dry cough with cold and feel a headache too. The patient of this medicine also has an increased thirst for water. Homeopathic medicine Hepar Sulph works well when the cough is loose and rattling in nature with cold. Sambucus is an ideal homeopathic remedy which is prescribed when there is stoppage and extreme dryness or blockage of nose especially during the night. The patient of this medicine gets up at night from sleep because of suffocation as a result of nasal blockage. Homeopathic remedy Ammonium Carb is prescribed when the nose is stuffed up entirely along with inability to breathe through the nose. The patient keeps the mouth open to breathe.